Contents this page on Cholesterol Test: What is a cholesterol test and how is it done? / How long before you know the results of the cholesterol test? / How accurate is a cholesterol test? / How meaningful is the cholesterol test result? / Does the non-fasting cholesterol test tell us anything? / What happens next? / Home Cholesterol Test Kits / WHY Home Cholesterol Test Kits? 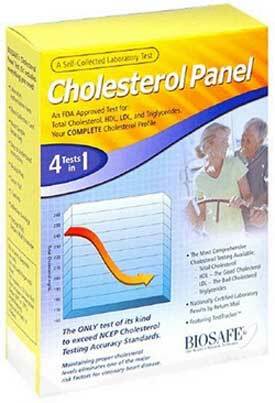 / Online cholesterol test kits - Reviews, Prices, Comparisons, Buy. What is a cholesterol test and how is it done? A cholesterol test is the taking of a blood sample by needle and syringe. The blood is then placed into a tube, which is then typically sent off to a laboratory, which then analizes the blood to see how much cholesterol is in it. The cholesterol test will typically provide several cholesterol level readings - one for triglycerides, one for hdl, one for ldl, one for total cholesterol and a cholesterol ratio will also be typically provided. How long before you know the results of the cholesterol test? The blood test is normally fast, the time taken to get the information back from the lab to your doctor is about a day or two, sometimes longer. So the wait time to get your cholesterol test result back is not really all that long. How accurate is a cholesterol test? The cholesterol test your doctor normally directs you to get is very, very accurate, like about 100%. Fasting or non fasting cholesterol tests are both very accurate - but the fasting cholesterol test is a lot more valuable and meaningful. How meaningful is the cholesterol test result? A cholesterol test may be close to being perfectly accurate, but the cholesterol test only measures the cholesterol in the blood when the sample was taken. THIS IS IMPORTANT to realize, as blood cholesterol can change very rapidly, depending on what you ate and when you ate it. It is generally agreed that fasting for 12 hours before doing a cholesterol test gives the most meaningful cholesterol level, as the food and drink effect on your blood cholesterol is then minimised, giving a more truer reading of where your cholesterol levels are. 1.. Provide a meaningful cholesterol test result which allows the sample to be compared top the general population or to norms that have been worked out to show whether you are at risk of developing illnesses, like heart attack or stroke, that are based on cholesterol levels. 2.. Meaningful cholesterol test results are also needed to allow you and or your health professional to monitor your cholesterol levels over time - via doing more cholesterol tests at regular time intervals. This allows one to see if the cholesterol level is responding to treatment. Obviously, if we didn't do the fast, then we don't really know how the cholesterol levels are responding to treatment. It may tell us how a certain food affects your cholesterol level, but it doesn't give us a bona fide cholesterol level that we can use for comparison purposes over time. Does the non-fasting cholesterol test tell us anything? Surprisingly, the non fasting cholesterol test does provide some worthwhile information. If the non fasting cholesterol test comes back normal or better, it normally does mean that your cholesterol is OK. If the non-fasting cholesterol test finds you have a borderline or high cholesterol level, then the test suggests that there may be a cholesterol problem that has to be looked into more. Some people will fall into this group because they ate something before doing the cholesterol test. A fasting cholesterol test will normally then be required, so that a meaningful cholesterol test result can be obtained. Thereby confirming or disproving whether you have high cholesterol or not. Home cholesterol tests are becoming more popular as cholesterol sufferers try and take a more professional approach to controlling their own cholesterol levels. Knowing that their life is dependent on getting their cholesterol under control, the home cholesterol tests offer a convenient way to find out how their cholesterol levels are changing, without having to go the inconvenience and cost of attending a doctor's appointment, being reffered to a lab for blood sample to be taken, then having to contact or see the doctor again to find out the cholesterol test results. WHY Home Cholesterol Test Kits? The cholesterol test kits have a place to play in fighting cholesterol. Doctors frequently say come back in six months for another cholesterol test. What happens typically according to the research and my own experience, is that the high cholesterol is seldom much improved, as cholesterol sufferers seldom have the knowledge to fix the problem, so they make some dietary changes and wait the six months for the doctor to repeat the cholesterol test. Six months is a long time to wait to find out if what you are doing is working. This is where the cholesterol tests come in. The home cholesterol tests allows you to check your progress every month or so, enabling you to make more adjustments to your lifestyle, diet and cholesterol medication, to achieve a better result faster. Below are the online cholesterol tests we suggest you consider and, yes, we review and compare these cholesterol tests that can be purchased online. BUT, when using home cholesterol tests / kits, do so after a 12 hour fasting - water permitted - so that the cholesterol reading is not so affected by a temporary reaction to a food or drink! REALLY, REALLY IMPORTANT, if you want to get meaningful cholesterol test results back that you can use to compare with other readings you may take, or have taken before. Cholesterol Panel Test is a self collected, laboratory analysis that measures the amount of total cholesterol, the amount of HDL and LDL cholesterol, and the triglyceride level in your blood. 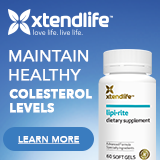 This is the most comprehensive form of cholesterol testing available. 1: Using the provided finger lancet, three droplets of blood are extracted and placed on the cholesterol test kit collection card to dry. 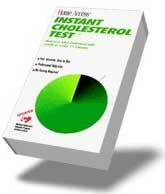 2: Insert the cholesterol test kit collection card into the provided mailer and post (postage paid). 3: The cholesterol test results are ready in about 5 days and then sent immediately back. If requested, a copy will also be sent to your designated health care professional. Instant Cholesterol Test Kit results are available in a fast 15 minutes. The test is simple and easy to use, requiring only a few drops of blood obtained from a finger stick sample. 2: Put a droplet of blood on the cholesterol test cartridge collection point. 3: Read the cholesterol test result in 15 minutes. Both of these cholesterol tests are accurate and FDA approved, so you know they are good. The big difference is that the Panel cholesterol test provides a very comprehensive analysis of your cholesterol and triglyceride levels, which allows you to see exactly how your scores may be changing. The cheaper cholesterol test, the Instant Total Cholesterol Test Kit, only provides a measure of your total cholesterol - it doesn't directly tell you if your good cholesterol has gone up or if your bad cholesterol has gone down. However, it would be reasonable to assume that if you are taking steps to reduce your bad cholesterol, that a drop in your total cholesterol test reading would suggest that your measures to reduce the bad cholesterol are working. You see, for most cholesterol sufferers, the bad cholesterol makes up most of the total cholesterol test score and the bad cholesterol is more likely to change than the good cholesterol is. If triglycerides are an issue for you, then the Panel cholesterol test is the one you will most likely definitely need. If your cholesterol test profile is the one you want - to know for sure how your cholesterol is changing or not changing - then the Panel Cholesterol Test is again the way to go. "Want to see your company's cholesterol test here? 1... You must offer a money back guarantee to your customer, if they are unsatisfied with your cholesterol test. 2... You must state your cholesterol test is tested and accurate for human use and clearly state any warnings about potential limitations of your cholesterol test. 3... You must accept that if we decide not to put your cholesterol test kit here, or to remove it, that we have done so only after careful consideration. For example, we do take customer complaints to us quite seriously, so how you treat your customer, our web site guest, is of utmost importance to us. Treat them fairly and we will do the same back to your company. 4... To remain listed here, your cholesterol test must be priced fairly to sell. Customers are not interested in being overcharged and wont buy from you if you do. Once we become aware that customers aren't happy with buying from you, your ad will be removed. The merchants of cholesterol tests on this page are currently meeting the above criteria to the best of our knowledge.